Slept well in a hotel room in Mürren. Unfortunately, there are clouds, fog and rain today. The lady from the hotel does not know if it snowed down over night to the altitude where I need to go. 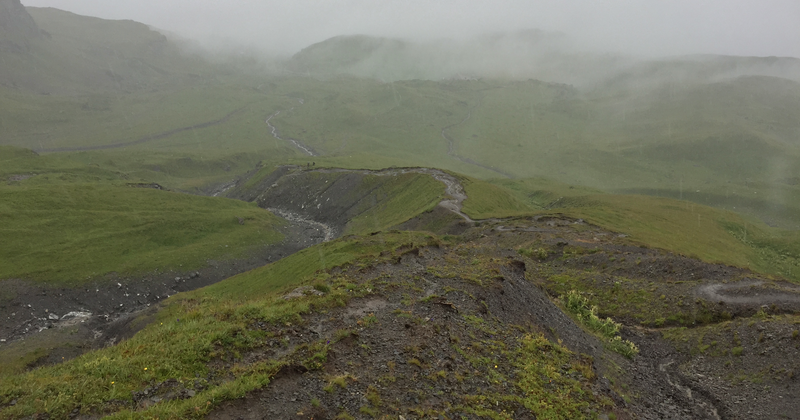 In Switzerland, it is common sense that if the weather is bad, you should not venture into the mountains. Ways may be slippery, you may not find the way and fall and there is a general concern about storms. Before I move outside, to see for myself, I have to eat breakfast. It is included in the price and I have to load some food. Not great however. During the night, I did some gymnastics for my knees. I mainly contracted my muscles in the legs, a technique I learned doing Barre à terre for dancers. It does wonders against knee pain. I have no problems at all hiking out in the morning. 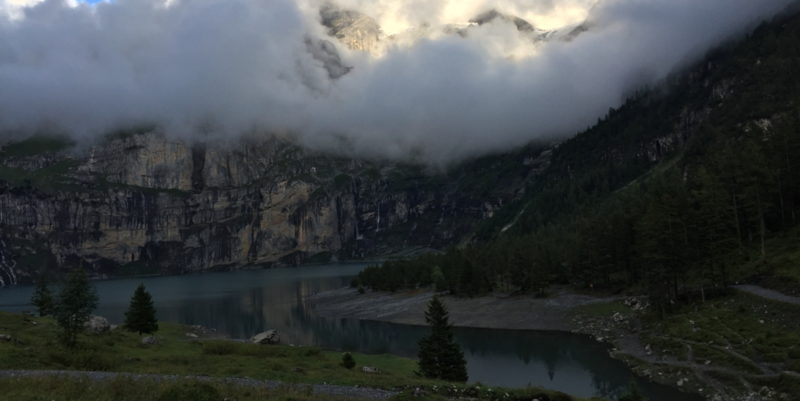 I cross Mürren, where the smell in the air reminds me to holidays in Pura, decades ago – my mother grew up there. People are heating their houses with coal. The rain and I get along well. Contrary to popular belief, there are rain jackets that will keep you dry while hiking for 10 hours straight or more. You will seldom find them in the bargain bins or even in stores. People tend to expect full featured rain jacket for the price of them. This one has not even under arm zippers. Instead it has just holes. No pockets and no system to adjust the hood. It is just minimalist sensational. I wear it the entire day and I never sweat more than I do anyways. It keeps you warm, as it is perfect in the wind. I guess ordinary goretex jackets, also the more expensive ones who are marketed as mountain prove and so on are developed for the average user. They are sure comfy for the way from your truck into the store and you will not get wet while loading your groceries into your car. If you hike in them it could be another story. Thats why I prefer trail running gear for hiking. Apparently, the Via Alpina crosses over the most demanding passes in this section. Unfortunately, I see little of the mountain glory. Rain and fog are my companions today. Few decide to show up on the trails. I like it more this way. There are however a lot of British people. During a steep part I get stuck behind an American group. Dressed for the Arctic’s, moving super slow. They even have a leader who gives instructions and warnings if the trail gets difficult. A quick glance on my app and I know that overpassing them here would cause problems. I just scare them every time I wait some minutes until they are nearly out of sight and then I get back up to them within seconds. They all wear the same shoes and have the same packs from Osprey. As soon as we are out of the steep part they are ordered to stop by their leader. I pass them below the radar as they wait for traffic from the other side to pass them. I have excellent traction and I never slip. My shoes (Hoka One One Challenger ATR 3) may look a little bit goofy but I think they stick better to rocks compared to boots. You can place them precisely where you want. Their outer sole is not made for super durability but for the ultimate grip. They stick like screwed to the rocks. I can hike so much better with trail runners compared to boots. Why should I lock my ankle? Needless to say, that I didn’t roll my ankle once in this two days. I cross the Sefinenfurgge in thick fog. There is a stair down. On the other side, it starts seriously to rain. I put on rain pants. They are also extremely comfy although way too heavy for hiking. They have these zippers running along the entire leg. Arc’teryx even says that they allow for protected business as you can fold down just the upper part according to your needs. I will spend the next 8 hours in these pants. Once stopped I utilize the break to eat. Today on the menu: Two different gels from powerbar, an energy wafer also from powerbar and some powerblocks again from powerbar. Within 2 minutes I eat more than 1000 calories. Job done. There are sheep but they sit in the grass and wait out the rain. Every sheep wears a bell but none of them makes a noise. Kind of spooky. Maybe they hope to not provoke the bear or the wolf or both of them. In this weather, you could walk right through unicorn assemblies without noticing it. Some mountain farmers finish their work and are about to enter their vehicle. The way they move makes me sad as they have obviously severe problems with their hips. It is just absurd. At the moment, the prices for milk are apparently lower than the costs farmers have producing it even in more moderate landscapes. Still they bring these huge cows up to the alps and do permanent damage to their joints. The cow situation in this section at least is better than in previous parts of the Via Alpina. 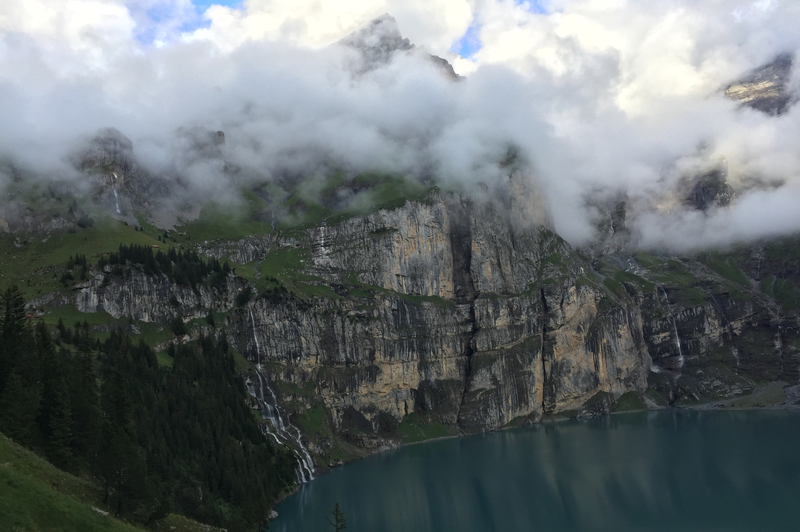 No wonder: Tourism is the main business in Grindelwald and surrounding towns. Apparently, people run out of time to farm and tourism is a better source of income. The patches are not as overgrazed and eroded here than they were on the Rigi. The Jungfrau region will remain attractive without glaciers. 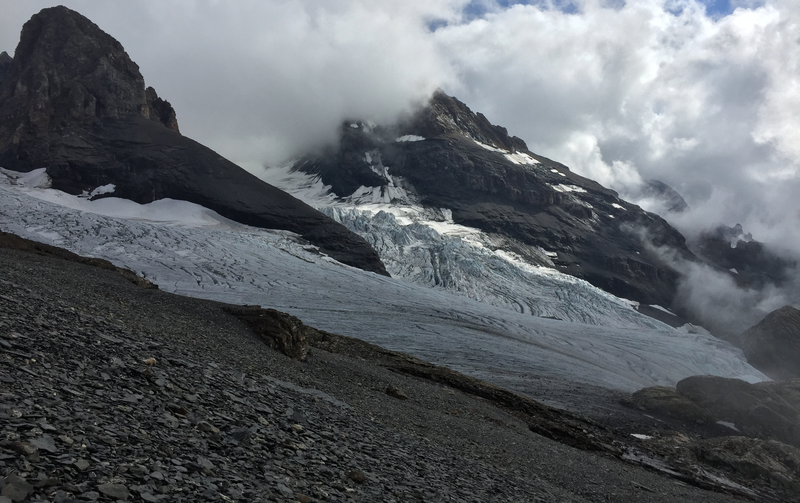 Scientists expect the glaciers to melt in an unprecedented speed in the coming years. If you like glaciers, waste no time. They are not growing. Today I see however none of them but I know they would be in sight without the clouds. It gets cooler and I have to mount winter gear. No chances to see wildlife. Yesterday I was following a rock face down and I was thinking it can’t be possible that I see nothing today. So, I carefully searched everything and sure enough there was a chamois eating up there. I push down to Griesalp. Apparently, there are excellent views. Not today so I start to climb towards the Blueemlisalphütte, one of these SAC huts. The climb is uneventful, just wet. The path has turned into small streams. Some groups come towards me and I ask a man with a British accent how the conditions are up there. They say it’s like here and they ask me where I want to go. I say to Kandersteg. They ask me if I want to do this today. When else? The last bit up to the hut is again on stairs. Out of solidarity I decide to visit the hut and eat something up there – they have a sign advertising their restaurant. The weather finally clears so I can snap some pictures. The moment I enter the hut I regret my decision. It is a separate world. They have signs for everything except for the restaurant. You have to put the pack here, the shoes there, the poles somewhere else. Over one door there is a sign “Niesenblick” so I assume that it is maybe the restaurant. Behind the door a woman is changing her clothes. I apologize, closing the door again. It is just embarrassing. I work my way through other doors and find the room where you have to put on house shoes and I finally find the restaurant. There are maybe 30 persons in the room and they play chess and cards, waiting out the weather. To be fair: From this hut, you can climb up another 3000 ft or so to the top of the mountains. It would be pointless to climb up today and potentially dangerous. Mountaineering crampons and helmets indicate that people also walk over the glacier and set out to do rock climbing. However, some also brag about their abilities saying that they did the ascent from Griesalp yesterday, mentioning the height gain seven times in one minute. It is not my world and I am happy to leave again. In the entire hut, there is this strange smell from sweat, humidity and toilets. The strangest thing happens when I return my plate. The lady behind the desk does not say thank you, as it would be expected, but yes, like she wants to educate me. I am 40 years old and there is a reason why I was never in a regular military force. 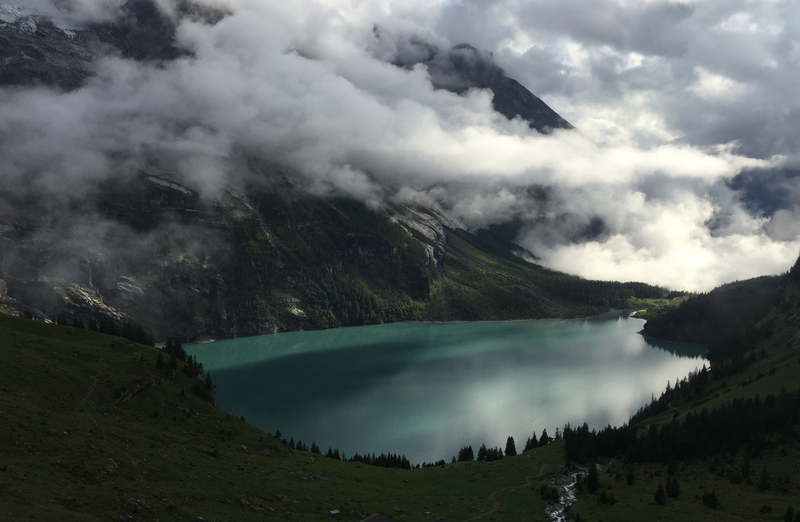 Down towards Kandersteg. The mountain farmers drive their cows back to the barns. As I wrote earlier, the dogs in the Bernese region are smarter than those in Appenzell. They think before they bark, so they realize there is no reason to bark at all and they do not move towards you. 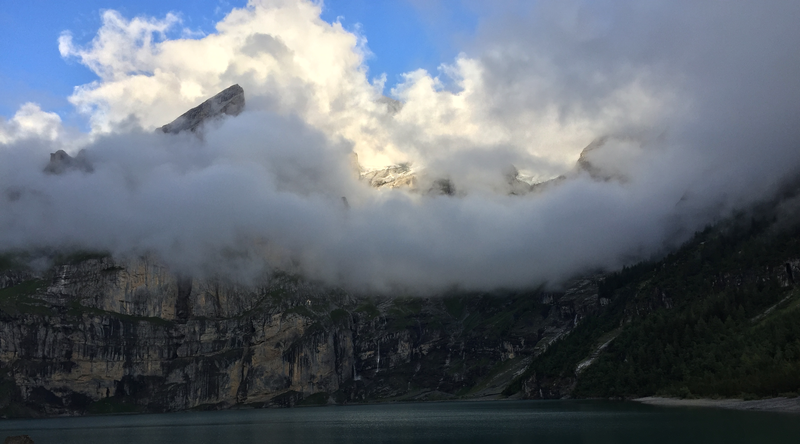 As I reach the mountain lake Oeschinensee, the weather clears for the second time today. It is really pretty. I immediately change my hiking mode taking pictures every ten meters. REGA helicopters take to the sky again. There was a crash of a small airplane in another part of Switzerland and somebody claimed, that you can tell that people are in severe conditions, when they switch of the engines, because this means that the doctors try to save the victims where they found them, instead of loading them to the helicopter and fly them to the next hospital. Today they just do touch downs. I take the train back to Zurich. When I am done with the Via Alpina I may come back to this section and do it again with the views.